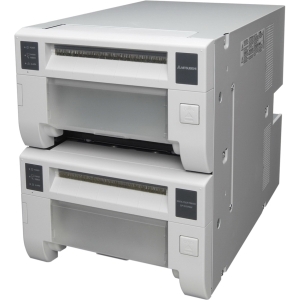 Mitsubishi's CP-D707DW is a dual deck, high-speed, professional event photo printer configured with two separate paper paths, providing the option of printing two different photo sizes or increasing output efficiency with high-speed photo printing. And this printer is fast! With the same media size in both of its dual paper paths, the CP-D707DW produces a brilliant 4×6 photo in just 5.9 seconds. That's (10) 4"x6" photos every minute! 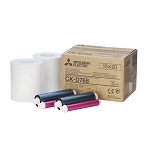 The CP-D707DW offers the choice of either Fine (high speed) or NEW Super Fine (high-resolution) print mode and Super Fine Matte finish with no change of media. The CPD70 is supported by genuine Mitsubishi media and produces stunning photographs in 2×6*, 3.5×5, 4×6, 5×7 and 6×8-inch sizes. The CP-D707DW uses a new image-processing algorithm that enhances image sharpness and clarity, and brings out the best in photographs. 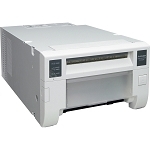 The printer's efficiency is increased with a unique cooling system that helps regulate the temperature of the print head and the internal power supply. And the CP-D707DW has a built-in energy saving mode which reduces power consumption to less than 1 watt. 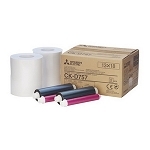 Mitsubishi's CP-D707DW, full-featured, dual-deck event photo printer is a fast, lightweight professional photo printer capable of Super Fine Matte prints, and Super Fine or Fine glossy photo prints with Mitsubishi's reputation for quality and reliability. *Update your printer driver to include the NEW Super Fine Print Mode, Super Fine Matte, 2 x6 Multi Cut! 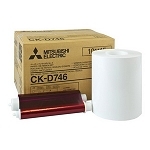 New firmware and drivers available for the CPD707DW, which allows these printers to print Superfine Print Mode, Superfine Matte, multi-cut a 4×6 into two 2×6 strips.